Sports are often associated with jock culture. It is commonly assumed that masculinity, dominance, and aggression are the winning formula in the sporting world. Even though physical strength does play a role in athletics it is not the be all, end all to success. There is also a huge mental component to sports. The mental aspect is the difference between champions and average teams. 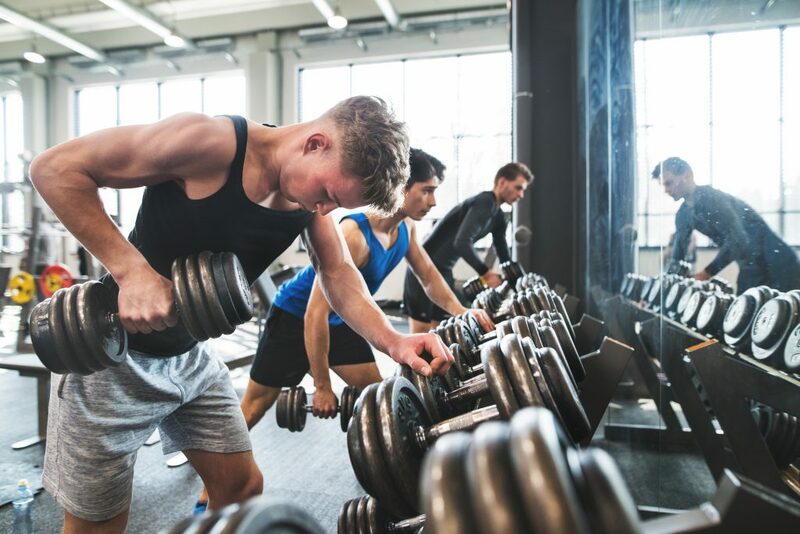 Young fit men doing strength training, exercising with dumbbells in modern gym. It is commonly said that 90 percent of sports is mental, while only ten percent is physical. The ability for an athlete to remain calm in stressful situations is paramount to their success. This brings me to the question what role does meditation play in sports? To the naked eye meditation and sports are polar opposites. Meditation is thought to be peaceful, relaxing, and staying present in the current moment. While sports are thought to be about reading, reacting, and following your instincts. Some of the most influential athletes in the world use meditation as a tool to fuel their success. According to zenfulspirit.com LeBron James, Kobe Bryant, and Derek Jeter have all used mindfulness to enhance their careers. It is not surprising that players who meditate find success. Life is all about balance, and mindfulness is a crucial element in staying centered. Take Kobe for example, he is known for a balls to the wall work ethic. He is one of the most driven individuals on the planet. However, all this hard work can be negated without the proper balance. Meditation allowed him to find a happy medium. Considering the fact that he won five NBA championships, I think it is safe to say that mindfulness played a role in his success. It is also important to note that he is not a physical specimen like LeBron. It was Bryant’s mental composure that made him one of the most elite athletes of all time. Another famous sports figure who uses meditation is Phil Jackson. Jackson is arguably the most successful coach in NBA history and has accumulated eleven championship rings throughout his career. He is often referred to as the “Zenmaster” because of his ability to include mindfulness is his teachings. According to theemotionmachine.com he included a number of different meditation techniques in his coaching strategy. One of the practices he used is one breath, one mind. This practice encourages players to meditate in unison together for a selected number of minutes. This exercise is used to increase team cohesion and build synergy within the collective unit. Another mindful practice that he implemented is encouraging players to remain the same after a win or a loss. This strategy allows players and coaches alike to remain balanced throughout a long and grueling season. This practice is a great reminder that sports are just a game and that regardless of the outcome it is just a small part of life. Another technique that he used to his advantage was his pre-game rituals. He showed his team some of his favorite movies and music to build cohesion between his players. Many coaches try and fit in last minute instructions during this period. He believes this is ineffective because players are filled with adrenaline before the game which makes it a bad time to have deep-left brain discussions. Instead he believes this is a time to foster positive energy, calmness, and build a strong team atmosphere. Even at lower levels of sports, meditation is a reliable tool to build success. I am a coach for a 6th grade basketball team and I believe mindfulness helped my team win a very close game. My team was in a tie game with about one-minute left. The opposing coach called a timeout and during this break I instructed our players to breath and remain calm in the moment. Our star player sat down in the middle of the team and placed himself in a mediation pose. Our whole team gathered around him and put their hands on his back and shoulders. When we went back onto the floor our star player made a perfect pass to an open teammate who made the game winning shot. I can not be 100 percent sure that meditation was the key to the victory, but all I know is that my team ended up winning the game. Mindfulness is important in all athletics, but it is most important in baseball. Baseball is a sport where even the best players fail seven out of ten times. If baseball players lose their center their career can quickly derail. Just ask Rick Ankiel. Ankiel suffered from a condition known as “The Yips”. The Yips essentially means that a player loses all of their confidence and that they can no longer complete the task needed to be successful at their sport. In his case he could no longer pitch the ball over the plate. In one playoff game he had five wild pitches in an inning. His career as a pitcher was never the same. Luckily for him, he re-invented himself as an outfielder but this is a still a very interesting case study about mindfulness and pressure in baseball. According to ozy.com over half of all MLB teams have some sort of mental skills coach on their payroll. This stat alone shows how important the mental aspect is in this sport. In a sporting culture where physicality is thought to be the most important trait, mindfulness is often overlooked. But meditation, mindfulness, and finding a center may be the key factor driving an athlete towards success, not an extra rep in the weight-room.